This is a variety we use the seasoning of pulihora so its called pulihora avakai. 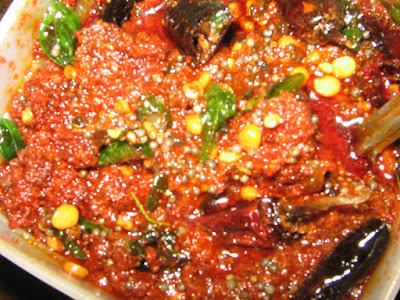 A simple chutney which can be prepared by 2 to 3 mangoes. Dry grind 1 cup mustard seeds in a grinder ,seive it again dry grind them.Even if the mustard powder is a little coarse enough, no problem. 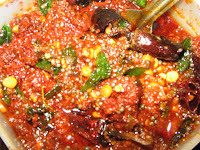 One day before preparing pulihora avakai,place mustard powder in a dry bowl,and pour piping hot boiled water 1/2 cup in to the mustard powder and mix well.Then place the bowl with mustard powder and water in the sun for a few hours until the powder mixture is dried completely.For every one hour mix the powder well with a dry spoon.This makes the water to dry soon. Now a days Salt is iodized so very less amount of salt is to be added,or else taste it. Take peeled and chopped mango slits in a small bowl. Then mix with the dried mustard powder,dry chilli powder and salt well thoroughly. Add oil to it and keep aside in a bottle.Let it settle for 3 days. On 4th day morning,place a pan on the stove add 1 cup oil to it. Place the prepared mango pickle in a bowl,and add the prepared seasoning to it. After 10 mins remove the lid and mix the pickle thoroughly well with oil and seasoning. Let it settle,for a week days outside,then store in a fridge.In India we keep them outside only,they remain normally,until unless there is shortage of salt and oil.But in other countries due to climatic conditions and centralized A/C we cant give guarantee. Can be stored in a fridge for a month or two. Very tasty with rotis and rice. There will be more mango slits when compared to the powder.